WHITE PLAINS, N.Y. (September 3, 2014) - White Plains Public Library was selected by the New York Library Association's Public Library Section (PLS) to receive its 2014 Building Award for The Edge, a groundbreaking library for teens. “The Public Libraries Section Board was impressed with White Plains Public Library's well planned and strategic building project that addresses the needs of its community and the future goals of the Library,” said PLS President, Sara Dallas. The award recognizes a construction project that has significantly enhanced the Library’s ability to provide services to its community. Emphasis is placed on projects that demonstrate cost effective solutions to space challenges as well as innovative usage of space and floor plans. PLS hands out two Building Awards annually to New York State public libraries--one to a library serving a population of less than 20,000 and the other to a library serving a population of over 20,000. "In White Plains, we are fortunate to have a creative and forward thinking Library staff and board of directors," said Mayor Roach. "Their vision first brought us the The Trove, the ground-breaking children's library. Now, they have taken the next step and, working with the City, created The Edge, a unique and innovative space for teens. This space is a manifestation of our shared commitment to enhancing the youth experience in White Plains." White Plains Public Library opened its new, 2,000-square-foot teen library , The Edge, in December 2013. In addition to providing a welcoming space for young people, The Edge also features a digital media lab with workshops on video and music production, coding, robotics, game design, 3D printing, and more. The Edge is a joint public/private initiative of the White Plains Library Foundation and the City of White Plains, with additional funding from the State of New York. Bermello, Ajamil & Partners, Architects, Inc., OLA Consulting Engineers, and J R Keller LLC were the architects; the project was managed by the White Plains Department of Public Works. 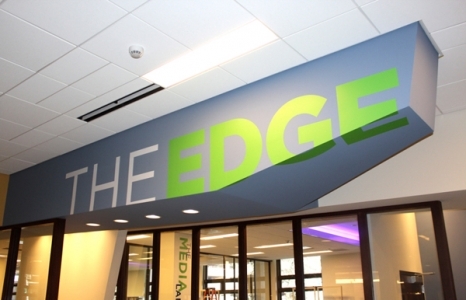 The Edge is the first phase in the three-phase renovation of the Library’s first floor. The New York Library Association's Public Libraries Section represents the interests and concerns of the public libraries of New York State. PLS endeavors to provide continuing education and leadership opportunities that promote and enhance library services. In addition, PLS acts as an advocate for public and political awareness striving towards adequate funding and support. The White Plains Public Library is located at 100 Martine Avenue, White Plains, NY 10601. For more information visit the Library’s website at whiteplainslibrary.org or call 914-422-1480 during regular Library hours.